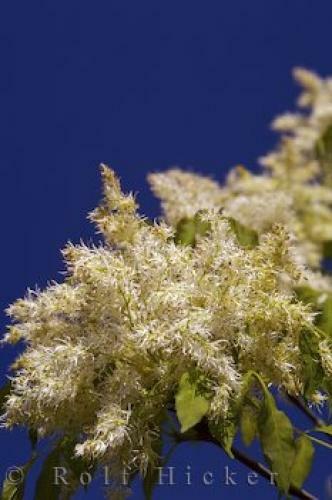 A flowering Ash tree is a picture of beauty at the La Source Parfumee Gardens in the village of Gourdon in the Provence, France. Parfumee Gardens in Gourdon, France. ... Ash Tree (Frene a Fleur), Fraxinus ornus at La Source Parfumee Gardens 3 kms from the village of Gourdon, Alpes Maritimes, Provence, France, Europe. I photographed this photo with the digital SLR camera model Canon EOS-1Ds Mark II, aperture of f/8.0, exposure time of 1/250 sec. on ISO 100, as always I used a original Canon Lens, the focus lenght for this picture was 70mm.